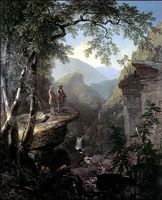 Carol Vogel reports in today's New York Times that the New York Public Library has sold Asher Durand's iconic Kindred Spirits to Alice Walton, heiress to the Wal-Mart fortune, for more than $35M. In an attempt to keep the work in the collection of a major, east-coast museum, the Met and the National Gallery of Art placed a combined bid for the painting. Even though the NYPL had offered preferred pricing terms to New York museums interested in the work, Walton's offer was too sweet to pass up. According to Vogel's report, Walton plans to exhibit the painting in a museum scheduled to open in 2009 that her family foundation is building in Bentonville, Arkansas--the home of Wal-Mart. Vogel quotes a statement released by the foundation as saying that the museum will "present perspectives on the flow of America's history and heritage through the eyes of the nation's most influential artists." I can picture the results already: Ross Perot's collection of Americana meets the long-defunct Huntington Hartford Museum of Art. I'm afraid that the Durand is heading off to a collection of American art that will be consistently curated to make didactic, patriotic arguments. The NYPL attempts to put a positive spin on the sale by claiming that they are happy the painting will be staying in America and will be displayed in a museum. Unfortunately, Durand's painting deserved better than this. On the upside, though, I'll bet it's just a matter of time before reproductions of this work, and the many others Walton has been acquiring, will be available in every Wal-Mart around the country. Wait, maybe that isn't an upside. Related: JL of Modern Kicks isn't as upset as I am.